You are enough. I’ve seen this phrase printed on t-shirts and coffee mugs, and painted on barn wood home decor. Just check out Etsy for decorative items emblazoned with this phrase. If you google it you will find blog posts, articles, books, TED Talks, a couple of movements, and plenty of Pinterest images. And for a fleeting moment the phrase makes us feel good. It is the message we want to hear. But Dear Mom, you are not enough. We are imperfect people living in a broken world. We spend so much time striving. Trying to reach some illusive point in our lives where we feel we have it all together. But we don’t need to strive, we need to abide. And just maybe we should be thankful for our imperfection. If we are enough, the focus is on us, not Him. Pride creeps into our lives. And we can begin to believe we don’t need God. It is in our imperfections that His strength shines through. In our weakness. In our need. Dear Mom, you are not enough. But He is. The simple truth is this: He is God, and we are not. And isn’t that a relief to you, Sweet Mama? You don’t have to be perfect, you don’t have to know everything, and you certainly don’t have to teach your children everything there is to learn. We have a God that is big enough for us and them. 1. His understanding goes beyond our own. So I can go to Him for the answers, I can ask Him for wisdom. He sees the whole picture, while my view is limited. And He will give us His wisdom when we ask. 2. He is our refuge. God is our strong hold. Our protector, our family’s protector. And He will guard our hearts and theirs. He places us under his wings—a refuge when we feel beaten down and exhausted. 3. He is good, and faithful, and his steadfast love endures forever. He is good. Sometimes when we look at difficult circumstances or the evil in this world, we may begin to question God’s goodness. But we live in a broken world because of sin, not because of God. And His goodness does not depend on our circumstance. If you ever question if He is good, look at his faithfulness. His steadfast love. And when you can’t see anything else know God proved His goodness by sending His one and only Son to die for our sins that we might live with Him forever. Yes, the unwavering love for us that sacrificed His son endures forever. He loves you, today, as you are. Meditate on these words. Come to me. Rest. Not the kind of rest solved with a quick nap or good night’s sleep, but a soul-settledness. One available to us no matter what is going on in this world. 5. He provides all we need. He provides all we need. To live, to parent, to educate our children. To be the wife and mother, daughter and friend God has called us to be. All we need. 6. He gives us strength. Do you feel weary sometimes, Sweet Mama? Overwhelmed by circumstance? Do you know how valued you are by God? Dear Mom, you are not enough. But the truth is even better. God’s Word encourages us in a way no message on a t-shirt or coffee mug or sign ever can. I want to give you a chance to meditate on the truth, of who you are in Christ. You can download a free 25 page devotional study and journal: Who I Am in Christ: A Scripture Writing and Prayer Journal. Say it to yourself over and over again. Meditate upon this truth: He is enough. And because He is, I don’t have to be. Let the God who loves you strengthen you. And don’t worry about being enough. Praise the one who is. This is SO true. We are not, and can not be enough, but Jesus is more than enough. I just finished reading Jennie Allen’s book, Nothing To Prove, and the whole premise of it is that we can stop striving so hard, because Jesus is more than enough for us. I think you’d really enjoy it! I so super love this! Just had a discussion the other day about all of the ‘motivational’ sayings out there that sound nice on face value, but are simply not Biblical. This was one of the ones we talked about, and you tackled it perfectly. Pinning and sharing. Really fantastic! Thanks so much Susan! I completely agree. And I know so much of this comes from a heart that wants to help and encourage other women, but we have to align everything with the truth of God’s Word. Waw, I am not enough because He is enough and I have to consult Him. A good reminder that I just need to stay calm no matter the situation. Thank you for this good write up. I was just thinking about this recently! Motherhood is such a sanctifying role, we truly need to rely on God at all times. Amen Sister! 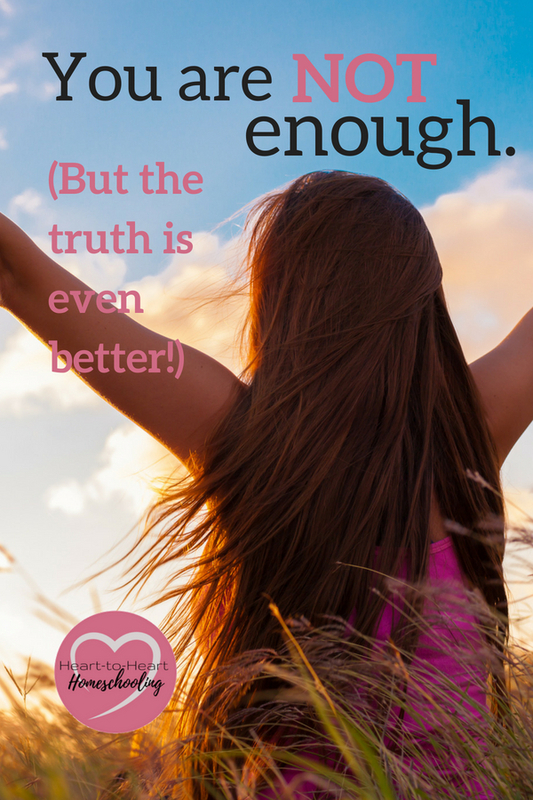 I am not enough but God is enough in all my motherhood struggles and exhaustion. What a wonderful Savior we serve. Blessings to you for heeding God’s voice to write this post today. Thank you so much Diana. I was actually a little nervous to publish it since it is such a popular mantra. But our need for Him is so exceedingly important that I felt compelled to do it anyway. A good reminder of much more peace we would have if we understood how he is the best part of us. We are frail and limited apart from him. He is enough. Love that Tara 🙂 He truly is. Yes! Such a slight shift in perspective is so powerful. When I realize that I am going to fail as a parent, it takes so much of the pressure off. What a relief and gift the grace of God is. Amen! It is so freeing to know we don’t have to be enough 🙂 God will work despite me! I would love to (If I can figure out how!!!!) Thanks so much Jenn! Beautiful blog post! Merry Christmas!! Thank you. And Merry Christmas to you too, Victoria! This is amazing! I’ve never considered the idea of being thankful for my imperfections, I don’t have a problem acknowledging them but being thankful for them is brand new territory lol! Thanks for this post! Great post Kay! I’m so glad and thankful that Jesus is enough and I don’t have to be enough. 🙂 There is such freedom in knowing that! Love this!!! Thanks for the great reminder! Perfect timing. You are so welcome. And thank you! Thank you for this truth! I cringe every time I see that saying because only God is enough, and because of him, we don’t have to be! That is freedom for this perfectionist’s heart. Thank you for reminding me of it today. Yes. It truly is freeing to know He is our strength! I cannot say “Amen!” enough to this post! I love seeing this truth proclaimed, because true freedom is found in relying on Him and not ourselves. As you said, our glorious God must be our refuge and strength as moms, because the world’s encouragement is so fleeting and superficial. He alone can sustain us during the high calling of motherhood. Thank you! So thankful for our loving Father 🙂 Thanks!